GeoBistro – Inspired by the global cuisines! — Reviewed! What: New Launched global cuisine restaurant. Viman Nagar in Pune has so many wonderful restaurants like Khiva, Wild Sugar Patisserrie and Cafe, Copper Chimney, Indigo Delicatessan, Punjab Grill and lot more. Recently, I was invited for the tasting at a week old GeoBistro. Located near Clover Park, Viman Nagar, this contemporary bistro is owned by a passionate foodie couple who dreamt to start their own venture. As the name suggests, Geo Bistro is inspired by the global cuisine and the interiors too are on the same theme. Indoor and Outdoor Seating is available. I loved the minimalist yet classy set up. The global travel inspired photo frames were beautifully adorning the walls. Pastel shades mainly brown is used to enhance the interiors. And the need of the hour was also taken care of – charger point! Haha. The space can also be utilised for casual meetings, or sitting, working and munching simultaneously. Consultant and Chef KM Saif has designed the extensive menu. I have always liked his innovative creations just like the one we had at Oozo Bar and Diner, Mumbai. Coming on to the Geo Bistro, the dishes served here are out of the box! Some might surprise you and some might leave you to ask for more. You have everything on the menu right from the global appetizers to salads, kebabs, sizzlers, grills, sandwiches, burgers, pastas, pizzas, smoothies and more. My most favourite out of the box drink, Ying Yang Martini (non-alcoholic), was not only eye-pleasing but also lip-smacking. A must have for the chocolate lovers. Yeah! It had a fine balance of chocolate, whipped cream, coconut milk, vanilla ice-cream, m.n.ms and chocolate shavings to shape the ying yang sign. Soothing flavours, mild sweetness of coconut and offcourse chocolate adds to it. Highly Recommended! Another very creative virgin drink was the Halloween Blue Pineapple Mojito. It was presented in skull glass and the use of dry ice was done to give the spooky feel. This mocktail was a perfect concoction of muddled pineapple, mint lives, lime, topped with blue carcao, pineapple juice and crushed ice. Next on the table was the nice mix of fresh cucumber and spicy jalapeno. The spice hits after some sip. Cucumber, Jalapeno, green chilli, lemon juice blended with ice was served in a martini glass placed over a bowl of non-alcoholi blue curacao and dry ice. The dramatic presentation was worth experiencing. All those who love tomato flavour, Michelada is for you. I preferred Virgin version though it is more famous and flavourful mexican beer cocktail. A strong yet delightful mocktail had tomato juice, stirred with tobasco, worcestershire sauce, soy sauce, tajib seasoning topped with ginger ale. It was spicy with a strong tomato flavour. Middle eastern pie – Fatayer, stuffed with mixture of spinach, parsley, zatar, sumac, and feta cheese was our first appetizer. This was a perfect crowd pleaser party food. The stuffing was cheesy with spinach and medium spiced. I like it. Another unusual recipe – Vegan Overloaded Nachos. I never thought Nachos can be prepared and presented in this way. Everyone can enjoy the guilt-free cheese-less nachos. The tortillas itself are made with spinach topped with beans, vegan cheese (prepared with cashewnuts, almonds, almond milk and chipotle), black olives, cherry tomatoes, green onions, garnished with coriander and served with salsa. The tortillas were just perfect!! The vegan cheese texture was granular and had the prominent taste of cashews. Tastes nice but different than the regular cheese nachos. Potatoes and Cheese make a deadly combination and trust me this appetizer was surely irresistible. Potato Cheese Lollypop had nice mix of potatoes, shallots, black peppers, parsley, cheese and served with spicy chipotle mayo. This deep fried snack is just perfect. The outer coating was nice, crisp while the cheese melts in the mouth with very first bite. Must have! A highly recommended dish is the Spicy Sambal Buffalo Cauliflower Bites. It tastes somewhat like the Gobi Manchurian, I would say better than that. The Caualiflower florets were deep fried and tossed with onion, garlic, pepper, green onion and spicy sambal sauce. This dish is the burst of flavours in the mouth. A perfect balance of spice, sweet, tangy taste. One of the addictive appetizers were the Bread Bites. Toasted bread coins layered with mashed potatoes, topped with veggies in spicy sauce and baked with mozzarella cheese. It was medium spiced and crispy and bit sized portions were easy to eat. I loved it. Main course was interesting too! We were too stuffed to have anything, still the temptations of good food compelled us to try the Veg Casado, which in Spanish means Married Man. A complete meal in itself the Costa Rican meal plate had beans, sauteed veggies, fried plantains, crisp tortillas, salad, grilled cottage cheese steak along with tomato basil sauce and the parsley rice. Wow! One meal is enough to satisfy your hunger pangs. Every element was cooked nicely and the special mention goes to the tomato basil sauce. The desserts too had interesting options. We tried Lose those Love Handles and Nutella Pretzel Shake. My eyes rolled when I saw the Diet Shake and yes, what a pretty looking and the power packed shake it is and thy name is Lose Those Love Handles. A sinful concoction of Fresh kiwis, dates, almond, low fat milk, low fat vanilla ice-cream, blended with ice and beautifully decorated with fresh kiwi slices. This thick shake is my all time favourite. Will go again for this one! :) Highly Highly Recommended! 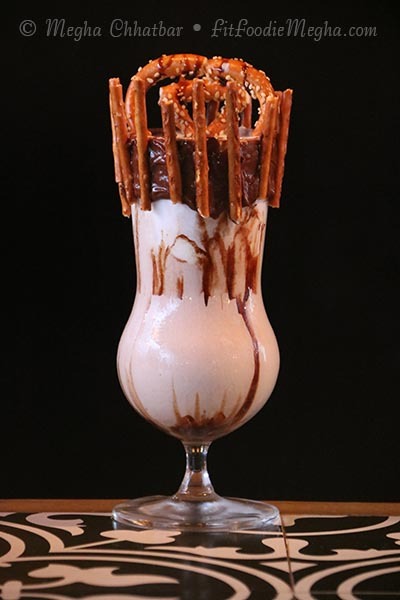 Next we had Nutella Pretzel Shake which looked so pretty, sinfully chocolatey. Milk, Chocolate Ganache, Nutella, Vanilla Ice-cream, Pretzel garnished with nutella, pretzel sticks. A must have for all the chocolate lovers. Highly Recommended! Oreo Cookie Shake was next. Classic dessert with oreo cookies crumbled, topped with vanilla ice-cream and adorned with oreo. It is just like eating oreo and ice-creams. Nicely made. Overall, GeoBistro has the vibes to attract the crowd with the good food, quick service and fantastic casual ambience. The Ugly Duckling – More smoked food in the new menu! — Reviewed! One of the few places in Pune serving smoked, grilled, slow cooked food is The Ugly Duckling. They completed a year in 2017 so the menu and interiors are tweaked a bit. This was my third visit to the Ugly Duckling and this time it was to try the new and improved menu. Keeping the core theme of smoked dishes in mind, the new menu is basic yet classic. Appetizers had two choices of scrumptious Onion Rings and Mozzarella Sticks. Then to ease down the selection of dishes, The Ugly Duckling do have the choice of Sandwich Meal, Hot Dog Meal, Burger Meal, Meal Combo for 1, Meal Combo for 2 and best part they have meal for kids too. Started the meal with the freshness of HoneyDew Melon Drink. It was bit syrupy and sweet but with the punch of soda base. On the other side Cherry Coke was a fantastic beverage. Onion Rings are a perfect appetizer for any occasion. I like them crunchy but unfortunately the onion rings served to us were single coated which lacked the crunch. The feedback has been given to the owners and they surely will work upon it. Next was the Mozzarella Sticks. This popular and flavourful finger food was nicely crumbed and fried to perfection. Tasted good with the dip. I am a huge fan of sandwiches and more when it comes to the grilled ones. Tried the Grilled Cheese sandwich at The Ugly Duckling, though it had good amount of mozzarella but somehow lacked the seasoning. Quite bland one. I suggested them to add herbs or spices to it to enhance the flavours. Main course was the Mix Veg Platter for 2. So, this one platter includes choice of meat/veg served with in-house BBQ Sauce, Boiled Corns, Chipotle Sauce, Mustard Sauce, Slice of bread, House Fries, Coleslaw and any 2 beverages. This veg platter is priced at Rs. 459 ++ which is bit steep for the portion size. I found the platter sufficing a single person only. So I chose Mix Veg Platter which had the Memphis Paneer which was mildly grilled and drizzled with memphis. Paneer tasted raw. I found it very basic and uninteresting. BBQ sauce was super addictive and flavourful. Sweet corn were just boiled, I wish they had some spices and not that then atleast sauteing in butter would have made a huge difference. Mix root veggies were nicely cooked. French fries were crispy. Overall the platter was good, I hope they improve the portion size especially for vegetarians. Last but not the least – Desserts. I tried Frozen Hot Chocolate and Maple Cheese Mousse. Chocolate anytime is a clear winner. Loved the Frozen Hot Chocolate, totally sinful! The maple cheese mousse needed more of maple punch. Staff is comparatively new and need some training. Also, I really miss some of the dishes from the previous menu. But its good to know that they are sticking to the core theme of grilled and smoked recipes. Overall, it was a nice experience and offcourse a treat for non-vegetarians. Salad Grills – Start a healthy lifestyle! — Reviewed! 'Health is not about the weight you lose, but about the life, you gain'. With the fast paced lives, we tend to eat junk, even if we don't want to. What you eat is what you become – a well said proverb. Eating fresh fruits or veggies (feasible) in their natural form gives the maximum benefit. I believe healthy outside starts from inside. So, what we eat should be carefully taken care of. I am a huge fan of Salads, especially when they are perfectly made. But with loads of work and lifestyle, don't get much time to prepare a balanced diet. Even if we try daily, we tend to miss out something on to make a complete meal. For the rescue are the Salad Subscriptions brands. One of them is the Salad Grills, and as the name suggests, they specialise in Salad and all healthy! Founded by Dr. Suhas and Dr. Sandeep, Salad Grills are based in Kalyani Nagar and do have Meal Salad Subscriptions delivering across Pune. You can choose as per your requirement..
Green Meal (Veggies+Fruits) starts at Rs.550 per week. Power Meal (Veggies+Fruits+Proteins) starts at Rs.675 per week. Premium Meal (Veggies+Fruits+Proteins+Carbs) starts at Rs.790 per week. Salads are available in two sizes – Small and Regular. Starting with the Grilled Paneer Salad (Rs.230 for the regular portion) and trust me it suffices two persons. The salad is a fantastic medley of colors and taste as it has Cilantro-Chilli Paneer cubes, Broccoli, Bell peppers, Leeks, Black Olives, Assorted Veggies on the bed of lettuce, topped with flaxseeds and served with Creamy Italian Dressing. I loved the textures and burst of flavours with bite. Italian dressing perfectly blended with the salad. I love Quinoa too and more when it is combined with salad; so had the Citrusy Quinoa Salad (Rs.270 for the regular). This salad box had the freshness of cucumber, tomato, tartiness of orange, the power of quinoa, broccoli, spring radish, assorted greens and served with Orange Vinaigrette. It was bit acidic so adding a bit of vinaigrette would also work. Was really eager to try 100% Whole Wheat Thin Crust 10" Pizza, so had BBQ Heaven Mushroom one (Rs.370). Since my location is on the other corner, the delivery time spoiled the taste of it. Though it was loaded with veggies like broccoli, mushroom, gherkins, baby corn, onion, and carrots, it surely lost its shine during transit. No complaints though. I'm sure it tastes best when served hot or may be immediately after the delivery. The favourite part – Smoothie. I tried the Peaching Beauty (Rs.190) which was the perfect melange of peach, litchi, and greek yogurt. Thick, mildly sweet and extremely delish. So people, if you want to start the healthy lifestyle, take your first step and indulge in healthy eating which starts at Salad Grills. You can visit their website and order online through Swiggy, or Zomato. Limitless Lunches at Gong – Reviewed!